Opening a scholasticate at Pune was a long cherished desire of the Indian Province. 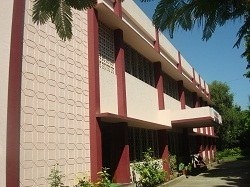 Seminarians were sent for Theology to the Jnana-Deepa Vidyapeeth (Pontifical Athenaeum) in Pune from the year 1973. However, they had to be accommodated either at Papal seminary or De Nobili College, which are the scholasticates of the Diocesans and Jesuits respectively. The realization of the desire to have our own scholasticate took place in 1985 when the Indian Province purchased an apartment consisting of four flats within the co-operative housing society, called Gera Terraces II, in the Viman Nagar, in the vicinity of Pune airport. Thus, with the first rector, Fr. James Palayoor, and 9 students, Vincentian Vidya Sadan had its beginning. The house being at a considerable distance from JDV, the students had to face inconveniences of various kinds. So while remaining there, efforts were on to purchase a house or land in the vicinity of the Institute. In 1987, a plot was purchased from the CMI Fathers. And on 9th January 1988, Very Rev. Richard McCullen, C.M., the then Superior General laid the foundation stone. Bishop Valerian D'Souza of Pune blessed the Study House on 25th of September 1989. Fr. Basil Thottamkara, the Rector since 1986 and the 10 students of the time moved to the new house on 11th of October 1989.